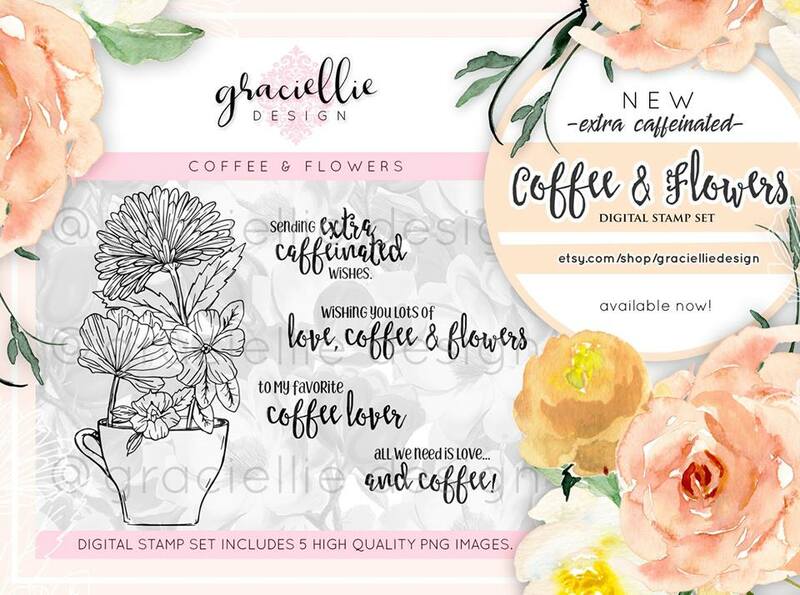 Did you enjoy seeing all the creative coffee themed inspiration in the recent spring + summer coffee lover's blog hop as much as I did?! So many wonderful creations!! 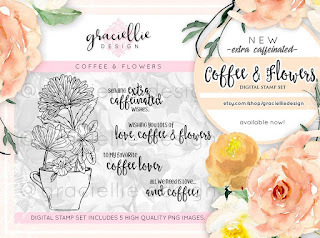 Today I have another card to share in the coffee theme -- it features Graciellie Design's most recent release - Coffee and Flowers. This time instead of coloring my digital image - I printed it in brown and created a shabby chic card around that! This is awesome! I love the browns and the dictionary page. Of course i love that stamp. Great card! Very nice interpretation of the challenge elements. I think newsprint always adds character to a project! This design is very rustic and romantic. Thanks for sharing with us at Shopping Our Stash! This is beautiful and very cleverly done - it was a great idea to print the image in colour and then leave it - it stands out against your fabulous layering and embellishing. love this combination of pink, lace and burlap! Your card is so pretty and the book page background is perfect for our 'Letter Perfect' challenge theme at Frilly and Funkie! Hugs! sweet image, love the background you did to go with it, and the burlap and lace combo is so cool, such a great mix of textures!! This is gorgeous, Esther!! The pretty flower is the perfect touch! This is so pretty. The book paper sets off your stamped image so nicely and the burlap and lace are fabulous together. Thanks for joining us at Frilly and Funkie.